Spring Festival celebrations await on Pig’s Feast Slot at Wicked Jackpots! Join the overweight pig for lots of fun on this Eyecon slot which is packed with 5 reels and 25 lines. Here, you can learn more about the Chinese culture which regards pigs as symbols of luck and abundance. So, you can already imagine how lucky is a chubby pig! Pig’s Feast Slot comes with a colourful background and crisp cartoonish graphics. It also comprises red lanterns and festive buntings. The oversized pig is inviting you for a mouth-watering feast on the occasion of Spring Festival. Join in and find delicious symbols on the reels, such as Hot Soups, Rice Bowls, Teapots and Dumplings, as well as a male Pig and Lady Pig. Launch this fun-filled slot game on any kind of device at Wicked Jackpots! It is time for some goodies on Pig’s Feast Slot! Get started by toggling the “Coins” button and selecting a bet amount of your preference. You can now press the Spin tab to set the reels in motion. When at least 3 identical symbols are lined up on the reel set, you are rewarded with a payout. Also, don’t forget the Auto Play option which allows you to enjoy a number of spins played in an automated manner. 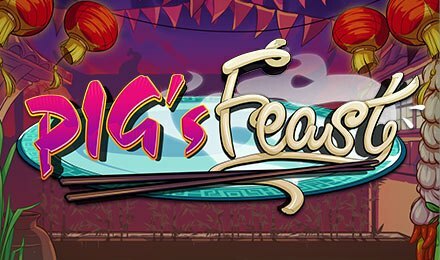 Bet Levels: Pig’s Feast Slot does not provide bet levels. Amount of Paylines Selection: The 25 win lines on the game remain active all the time. Coin Values: Various bet amounts are at your disposal, varying between 1 and 50 credits per line. Have you spotted the Rice Bowl? On Pig’s Feast Slot, it appears stacked on the reels. When they reach the top, fireworks light up revealing random multiplier values. It does not come as a surprise that the Pig symbol is Wild on Pig’s Feast Slot! It takes the place of any symbol in a winning combo, except for the Lady Pig. It is a very lucrative symbol as it also doubles your payout! Don’t miss the Free Games Feature on Pig’s Feast Slot! A minimum of 3 male Pigs on the reels helps to activate it. With 3, 4 or 5 Pig symbols, you can trigger 15, 20 or 25 free games, respectively depending on the dumpling you choose during the Prize Pick Feature. Now, on to the Prize Pick Feature! On Pig’s Feast Slot, it is triggered when 3 or more Lady Pigs show up. When the feature is active, the Lady Pig holds a platter containing dumplings. Select any of them to earn a maximum payout of 100x your triggering bet. Plus, obtain 2, 3 and 5 picks when 3, 4 and 5 Lady Pigs turn up, respectively. Enjoy the celebratory atmosphere on Pig’s Feast Slot at Wicked Jackpots! Load it up and get ready for plenty of fun. Good luck!